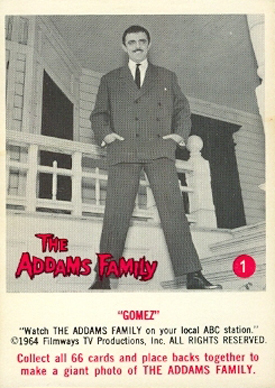 1964 Donruss Addams Family remains one of the most popular sets of vintage trading cards despite the fact they're based on a show that lasted just two seasons. Despite a relatively short life as far as first-run episodes go, The Addams Family has survived and thrived thanks in part to decades of reruns on TV and DVD, and a pair of movie remakes. Impossible to forget, Gomez, Morticia and the rest of the ghoulish family delivered a fantastic mix of harmless horror and silly sitcom laughs. 1964 Donruss Addams Family is a fairly straightforward release. The checklist has 66 cards, all of which have a black and white photo on the front and a puzzle on the back. Card fronts have a white border with a red caption under the picture. This is followed by copyright info and a note encouraging collectors to collect the entire set. All 66 cards fit together to form one huge puzzle -- a portrait of the family. When laid out, the puzzle is six cards wide and 11 cards high. A Canadian version of the set exists. Ironically, these cards have "Printed in the USA" stamped below the picture. The regular versions do not have the stamp. 1964 Donruss Addams Family cards are still highly collected. Even though they're not particularly rare, singles can still run several dollars. Professionally graded cards can run into the hundreds with an extremely high grade. 2 Somebody Drank My Embalming Fluid! 4 Will the Real Granny Please Stand Up! 8 Ever Seen a Train in Orbit. 10 This Will Stop His Headache! 13 Next Time-Use Your Zip Code! 14 Want Some lizard Soup? 21 Here He Comes...Now Do Your Stuff! 22 Yes, We Have a Room for Rent! 23 I Can't Stand a Lumpy Mattress! 24 I Always Use Live Bait! 26 He'll Get the Point Now! 29 Yes, the Real Estate Is Getting Cheaper! 30 Of Course I Ride a Broom! 31 Its So Nice and Gloomy In Here! 32 What Do You Mean-Get a Receipt? 33 What'll I Wear for Halloween? 35 I Always Play in Poison Ivy! 40 It Only Hurts When I Cough! 43 Bury the Next One over There! 50 You're a Real Cut-Up Fester! 52 Whaddya Mean, I Need a Man's Deodorant? 53 Son, Now Don's Scalp Fester! 56 I Won't Be Home for Dinner! 58 Let's Eat Before He Wakes Up. 60 What Do You Mean, Follow You? 62 Hang Around and I'll Call the Butler!